It is the dream of all most every woman to have a perfect glowing and smooth skin. 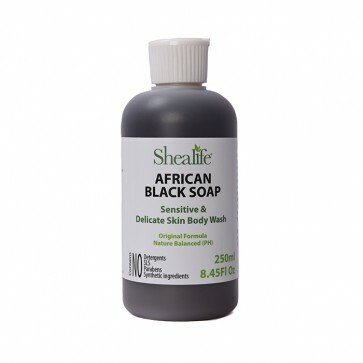 If you are expecting one of the finest and genuine products at very affordable prices in the market, African black soap by Shea life is one of the best products that you can trust upon blindly. Coming up with the trust of millions of people; Shea Life has offered this fantastic product at a very affordable price tag. It is a 100% organic and natural product by Shea Life for which you have to pay a few bucks only. To maintain the originality of the products included; there are no added perfumes or scents in the African Black Soap. This excellent product by Shea life is an excellent remedy for dry, dull and damaged skin and works efficiently on Eczema, sensitivity and psoriasis prone skin problems as well. The traditional and pure natural formula works effectively on skin offering creamy soap foam. The ingredients involved in the product are; natural and biodegradable and have no added SLS, Detergents, Parabens, and Synthetic ingredients. You can use this product as a moisturizer as well offering you a glowy and healthy skin. Works efficiently on dry, damaged and dull skin and an excellent solution for Eczema, Psoriasis prone skin and Sensitivity as well. Sunlight protection, vibrant ingredients, healthy and glowy skin all embedded inside one package. This excellent product by Shea life is being constructed from 100% organic and natural rich ingredients like; Aqua, Shea butter, Coconut Oil, Palm Kernel Oil, Cocoa Pod Ash. The price rate it includes is meager as a comparison to other cosmetic products on the market.